1 of 5 Heat oven to 400 degrees. In a small, lidded pot, combine 1 1/2 cups water, rice and 1 tbsp of the oil. Bring to a boil, then reduce heat to low and cook, covered, 15 minutes. Remove from heat and let stand 5 minutes. Fluff with a fork and stir in 1/4 tsp of the salt and 1/8 tsp of the pepper. Cover and set aside. 2 of 5 Meanwhile, make guacamole. Mash avocado in a bowl. Stir in lime juice, garlic, cilantro and 1/4 tsp of the salt. Set aside. 3 of 5 Pat salmon dry. 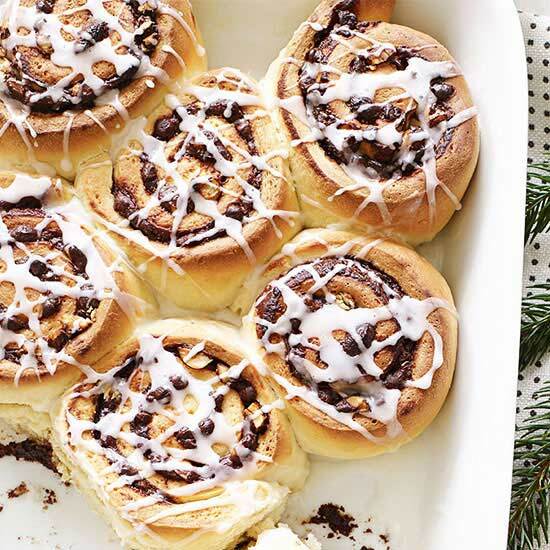 Place on a foil-lined baking sheet and rub with remaining 2 tsp olive oil. In a small bowl, combine coriander, paprika, remaining 1/4 tsp salt and remaining 1/8 tsp pepper. Rub onto salmon. Bake at 400 degrees for 15 minutes or until fish flakes easily with a fork. 4 of 5 Wrap tortillas in foil; place in oven for a few minutes until warmed through. 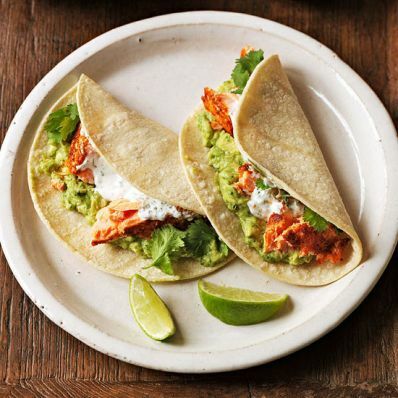 To assemble, flake salmon into large pieces, leaving skin on foil, and place on warm tortillas with guacamole, Cilantro-Lime Yogurt and, if desired, cilantro and lime wedges. Serve rice on side. 5 of 5 Cilantro-Lime Yogurt: Combine 1 container (6 oz) Chobani 0% plain Greek yogurt with 1 tsp lime juice, 1 tsp lime zest, 1 tbsp chopped cilantro and 1/8 tsp salt. Per Serving: 8 g sat. fat, 41 g carb., 446 kcal cal., 18 g Fat, total, 89 mg sodium, 0 null Mark as Free Exchange, 8 g fiber, 30 g pro.